What is this course all about? What in the world is an allegory? How in the world do I take a course online? All of these are important questions that we answer in this module. But first, what is a module? A module is is a chunk of related information and activities. In this course, you will find seven of them. This module is all about learning your way around the course a little bit and the classmates you will be taking it with. Follow the instructions below to complete the tasks for this assignment. 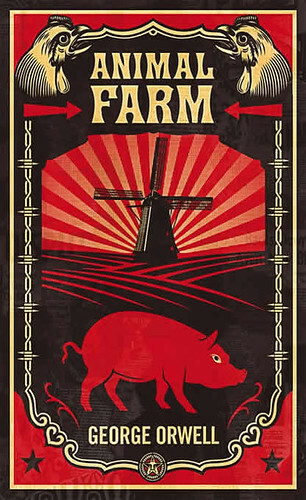 Begin reading Animal Farm. You will want to have finished the novel by the time you get to Module 4. It is recommended that you read chapters 1-2 for this module to stay on pace. Read information on the "What am I supposed to do?" page. Read through the list of resources available for this course on the Course Resources page. Read about your instructor on this page and his contact information here. Complete the Course Scavenger Hunt after reading the information above. When you finish, share the document with the instructor. Please make are you enable commenting privileges are allowed for the instructor. Head to the "Discussion: Getting to know each other" page. Follow the instructions and introduce yourself to your classmates. Take the time to respond to at least five your classmates' posts. When you finish all of the tasks above, review your work to make sure it is the best you can do, make sure all work has been submitted to the correct place, and then click the button below to advance to Module 2.